Heat the mustard oil in a pan. Add the cumin seeds, cloves,cardamom, cinnamon and bay leaf and fry for about 15-20 secs. Add the chopped onions and fry the onions till they become light pink and soft. Add the ginger and garlic and fry for another 5 mins. Add the chicken pieces and fry till the chicken become light brown. Now, add the chopped tomatoes, turmeric powder, chilli powder, cumin powder, coriander powder and salt and mix well with the chicken. Fry for 3-5 mins, then lower the heat and cover the pan and cook for 10 mins. No need to add water at this stage as the chicken and tomatoes will leave water. When the chicken is tender and the oil starts separating from the gravy. Add 1 and 1/2 cups of water ( about 300 ml) and let the chicken simmer for 10-15 mins. You can adjust the consistency of the gravy as desired. Serve garnished with chopped green coriander/Cilantro. 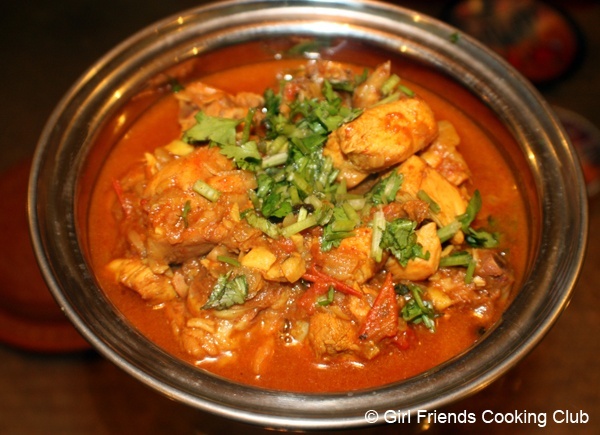 This entry was posted in All Recipes, Chicken, Nepali Food Recipes and tagged Nepali Cuisine, Nepali Recipes, Nepali style Chicken Curry by Kamakshi. Bookmark the permalink. Hi …..i’m naresh….. i’m in korea …. and me and my friend.s cook nepali food in the evening and this recepe really ihelped me a lot …… my first time trial with the help of your recepie was great……. now i’m the best cook among my friends so thanks a lot….. I am so glad to know that you found the recipe helpful …. Good Luck with all your cooking ! This is one of the most delicious curries I have ever eaten and my first try at a Nepali curry, thanks so much! I am so glad u enjoyed the recipe ..Happy Cooking ! Ps I also added green peppers and green beans, and it went together very well! Kamakshi – Thanks. A great recipe, great curry. Very fragrant and tasty. I used chicken thighs and it worked well. Also added more than the recommended spices (a mistake of concentration!) and it still worked beautifully! I have a Nepalese neighbour who gave me a very similar recipe to this. When I tried it, the gravy was much thinner and more watery than her version. How do I get it to be rich and creamy? i live abroad and i have never cooked any sort of meat before. I wanted to cook chicken but didn’t how and this has helped me. Thanks to you. Its good to see people post nepali recipes. now i can cook more nepali food.